DramaFever.com was a great niche website for fans of Asian dramas. It was murdered on October 16, 2018 by corporate American media greed. Yep. It feels like murder for an annual subscriber who never even got an email notification of this major change to come. Not only was I watching one of the first newer Japanese shows they had added to the site in a long time, I was also watching 4 currently airing dramas. One called “100 Years My Prince” I had watched four episodes, but had yet to add to my list shown below. Two of those shows can be watched on other legal streaming sites. The other two were exclusives. So, viewers were cut off mid-program with no alternative since AT&T doesn’t plan to launch whatever bundled streaming service they’re planning until 2019 and they own all the licenses. What AT&T and Warner Bros Entertainment don’t understand is the site wasn’t just a place to watch TV shows and movies like, for example, Netflix or Hulu. What distinguished sites like DramaFever and Viki from other streaming services is the wealth of news and information you could also find on the site and the app. Those apps build community online and sometimes even through offline events such as the DramaFever Awards, K-Con and the recent K-Expo in New York. The companies that bought DramaFever had a terrible understanding of the audience. Or maybe they just didn’t care. Twelve hours of watching foreign language television show is an time commitment beyond watching a show streaming in your native language. Twelve hours invested in a show that was exclusive to this website with no way to watch the remaining four episodes is cutting off life support for an avid fan. And for Chinese fantasy drama fans that often watch 50 to 80 episodes, I can’t imagine how devastating this is for them. What strikes me most is how unbelievably, poorly handled the entire debacle was. The communication was atrocious. Oh well actually it was non-existent. They didn’t have the decency to notify annual or monthly subscribers ahead of time (before the media knew) so that they could prepare in whatever way they needed to. Subscribers who heard via news articles posted on Facebook were left wondering if and how they would get refunds. Some people had recently subscribed. Others had just gotten billed and accounts automatically drafted in the last couple of days. The shutdown happened on October 16. I got an email the next evening saying my automatic billing was cancelled. Still no word about a refund for the remaining months on my subscription. 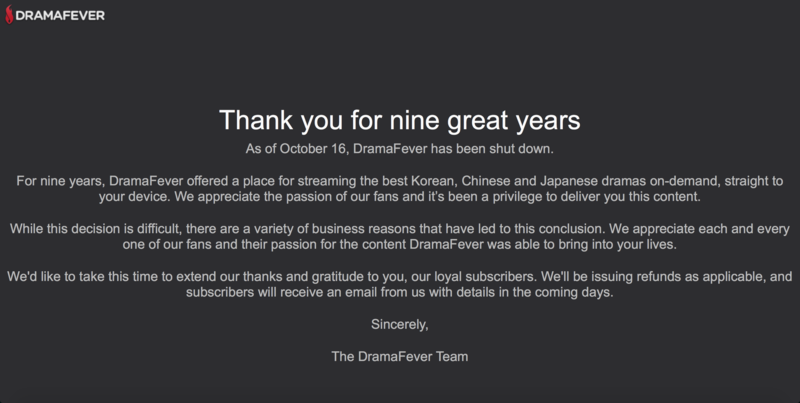 Cutting off the service instead of letting it run until the new streaming service was ready was a disservice to viewers and staff of DramaFever. Those former viewers have just been turned into haters, protestors and potential boycotters of the new AT&T streaming service. All because they were told it was a business decision to abruptly cancel a service they’ve depended on for not just Korean, but also Chinese, Taiwanese and Japanese currently airing dramas for nine years. AT&T and Warner Brothers Entertainment owe subscribers, viewers and DramaFever staff an apology. They need to mea culpa and say, “We admit we fucked up. We’re sorry,” while handing all of us our refunds or, in the case of staffers, severance pay. This is why many current streaming TV viewers left traditional American networks and cable for streaming services. Because the old style way of operating, not putting customers first, was a deal-breaker. Now they’re trying to bring the same old methods into the new realm of streaming service, looking at it through greedy eyes instead of consumers eyes. Good luck with your new customers. They won’t be the former DramaFever ones.